The good news is that the market for your solution is much bigger than you think it is. The bad news is that you need a completely new way of selling in order to capitalize on it. This is the message of ‘Selling is Dead’ by Marc T Miller and Jason Sinkovitz. From time to time we stumble on a company that happens to be actively searching for a solution like ours, or perhaps they call us. But they are simply the tip of the iceberg in terms of the potential demand for our solutions- that is if only all the other potential customers would wake up and realize they need our solution too. The authors start by pointing out that only 10% of your market is actively searching for a solution, the rest are either not aware they have a problem, or that they need a solution. But most salespeople are only equipped to sell to the former and end up neglecting the latter. They are selling to the shopping stage universe, which is, as the authors point out, ‘small, elusive and competitive’. So, I agree when the authors argue that salespeople cannot limit their selling to prospects that have a need, or even a budget for that matter. OK, most salespeople believe that ‘no budget equals no sale’, but that is an abdication of their responsibility to shape the strategic agenda in their prospect’s businesses and to shift how funds are allocated as a result. In doing this and creating the demand the salesperson is accessing a new market space that much bigger and much less competitive. So, a lot of the time you will be selling to buyers who are satisfied with the status quo, as opposed to looking for a solution. Transforming that satisfaction into a recognition of needs and a critical mass of dissatisfaction is essential if your prospect going to move beyond curiosity to a commitment to change. When you accompany your prospect on this journey, not as a salesperson in the traditional mode, but as a peer, or trusted advisor, you can bypass the competitive supplier against supplier showdown. 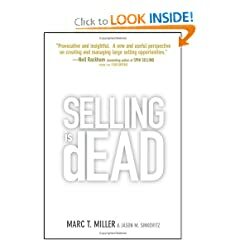 Here is why the authors argue that selling is dead, well at least the traditional mode of selling: Transactional salespeople struggle to advance buyers from the satisfaction, or to act as a catalyst for latent needs. That is because many salespeople insist on meeting only prospects prequalified in terms of budget, need, timing, etc. 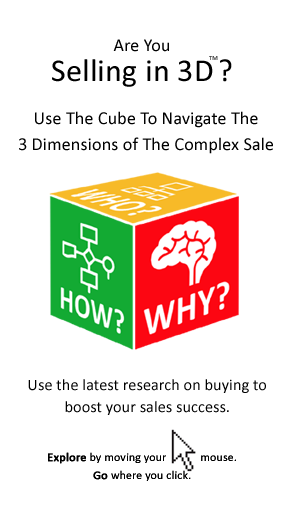 Selling to what the authors call ‘satisfaction’, or the majority of the market whose needs are latent, requires a consultative sales approach. The required model is one of engagement with the focus on creating the need for change first and the need for the seller’s solution second. By necessity that requires selling higher in the organization, where business strategies and objectives, and specifically performance gaps, rather than features and technologies matter. That means the salesperson’s approach, language, questions, demeanor and sales steps must change. Here is how Miller puts it: ‘In today’s environment, senior managers will not buy from salespeople – nor give them their time. They require salespeople to be more. Much more. To be business people who sell’. Afterall major purchases are not just buying decisions, but important business decisions. The ‘business person who sells’ focus is as much on a business decision as a purchase decision, addressing situation analysis, objectives, issues, options, and constraints, as part of the what the author calls the ‘solutions journey’. Of course, like any new business strategy it requires validation, quantification and minimising risk. So there it is – you must add significant value beyond the product, or service you are selling – in fact you must work on creating demand not just generating the sale. – Is your organization selling features and benefits or are you uncovering needs and adding value? – Can they sell the new applications that significantly impact a buyer’s bottom line? – Can they catalysts for and able to build a case for strategic change? – Are you in the business of demand creation? 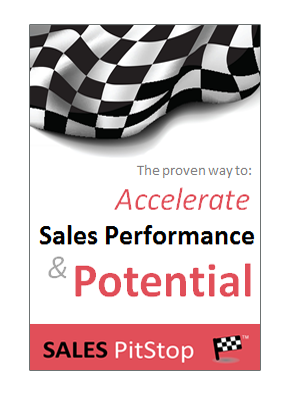 – Could your salespeople be described as customer business productivity, or performance experts? – Is your selling done by salespeople, or business people who sell? Few people have created their own sales model, fewer still have created a model of the buying process. However, Miller’s work in this is area is though provoking and enlightening. In particular if you are selling what your customers consider to be high risk innovations this book is an essential read.